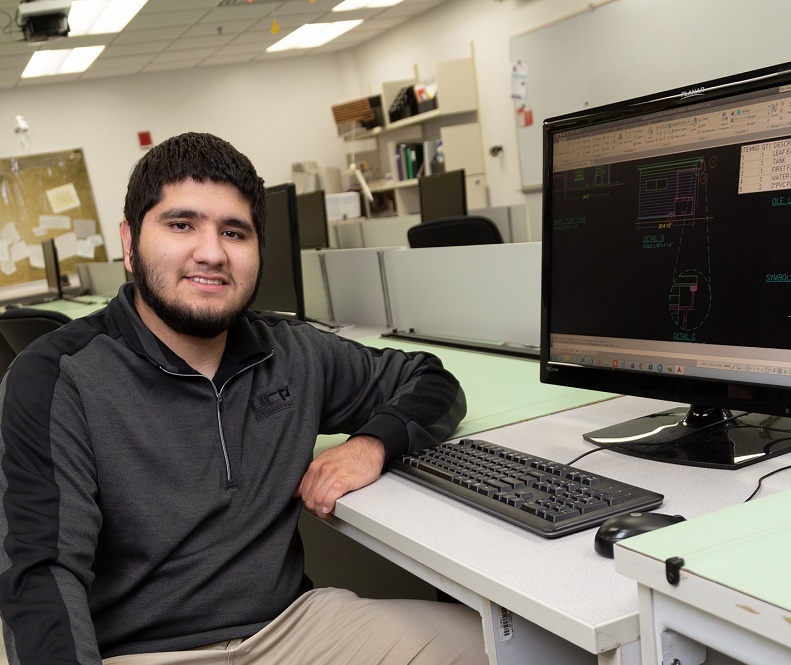 Joliet Junior College student Ramon Echeverria has leveraged the assistance he received from Grundy Workforce Services (GWS) into an internship, then a part-time job, and now contributes to the local workforce in a full-time capacity. It’s all happened prior to completing his associate degree in computer aided design and drafting (CADD). GWS, which operates under JJC’s Workforce Education Department, provides job search and career services free of charge. Funding comes from the Workforce Innovation and Opportunity Act (WIOA), from which Echeverria was able to pursue his career goals. “I honestly cannot thank the folks at Grundy Workforce Services enough. The staff there is friendly and encouraging. They helped me push and achieve my goals,” Echeverria said. Following a successful six-month internship with CAD Professionals in Morris, Echeverria was hired part-time by the company in spring 2017. He remained there for over a year until this past summer, when Echeverria was offered a full-time salaried position at Utility Concrete Products (UCP), where he creates production drawings. Boudreau also serves as CADD program coordinator at JJC. He credited Echeverria’s thoroughness, accuracy of work performed, and said he demonstrates a remarkable awareness of CADD software requirements. Echeverria said he loved that all of his JJC instructors have real world experience they bring to the classroom. “The knowledge of knowing what to expect in the work environment really complements the instructor’s methods of teaching,” he said. After graduating from JJC, Echeverria plans to pursue his bachelor’s from Governors State University. In September, after being nominated by GWS, Echeverria was formally recognized with the Individual Achievement Award by the Illinois Workforce Partnership. Also in fall 2018, Echeverria received the Edward Valintis scholarship for $1,000.